Hobbits & Hairdye: Baking | Disney Edition 2. Baking | Disney Edition 2. Do you remember this little blog post last year, when I attempted to make a Disney Tangled cake? Now we're all up to date its that time of the year again when I don my pinny and attempt to make some sort of edible disney project, except I wonder what it could be this year? Hmmm. FROZEN of course. If you don't know by now I'm obsessed with frozen and so is my little sister so of course it seemed only fitting that the birthday cake I made her would in fact be frozen related. Hi, I'm Olaf and I like warm hugs. 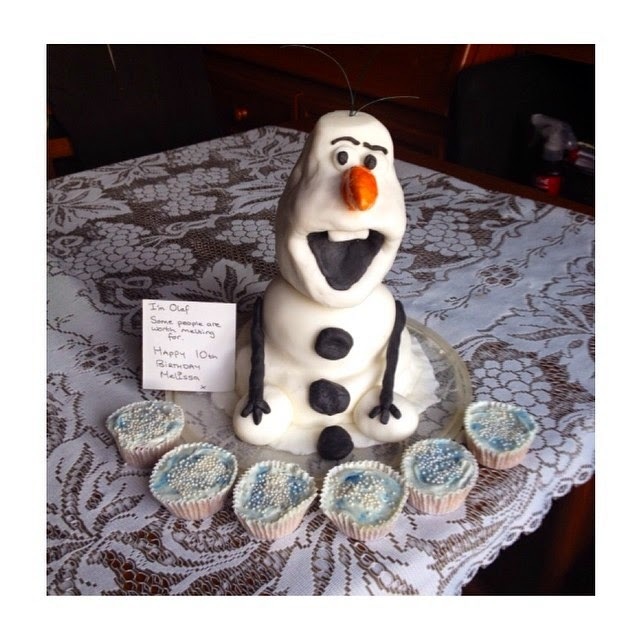 So here we have it my Olaf cake, I'm pretty proud of it if I do say so myself, it actually resembles him a bit which it could have very easily not have done. This was made with just a standard sponge recipe for the two body bits and then the head is rice krispy bars moulded into the shape of a snow man head, and then covered in **** loads of icing. How do you think Mary & Paul would rate it? Have you done any baking recently? What will I make next year?